Nanga Nyabau is one of the villages in Kapuas Hulu Regency, precisely in Embaloh Hulu district. It does’nt take a long time to visit this village from Putussibau*. Nanga Nyabau can be achieved in about 1 hour road trip. I have been to this village several times, but not with special intentions for traveling or backpacking. My arrival to this village was only to take my co-workers in the village of Nanga Lauk. Why go to Nanga Nyabau village? Its because the most plausible path to the village of Nanga Lauk is the river route starting from Nanga Nyabau downstream of the Palin River. After several visits, I learned that Nanga Nyabau Village has a betang house (long house) that has been designated as a cultural heritage object. While waiting for the boat pickup from Nanga Lauk, we visited the betang house in Nanga Lauk village on the advice of Rio. From where the car was parked, me, the nicke, elin, and aloy, walked across the suspension bridge that are very common in Kapuas Hulu. For the urban community, these bridges are very unique and interesting. But for rural community as in Nanga Nyabau Village, this bridge is a very important facility for the ease of their daily activities. 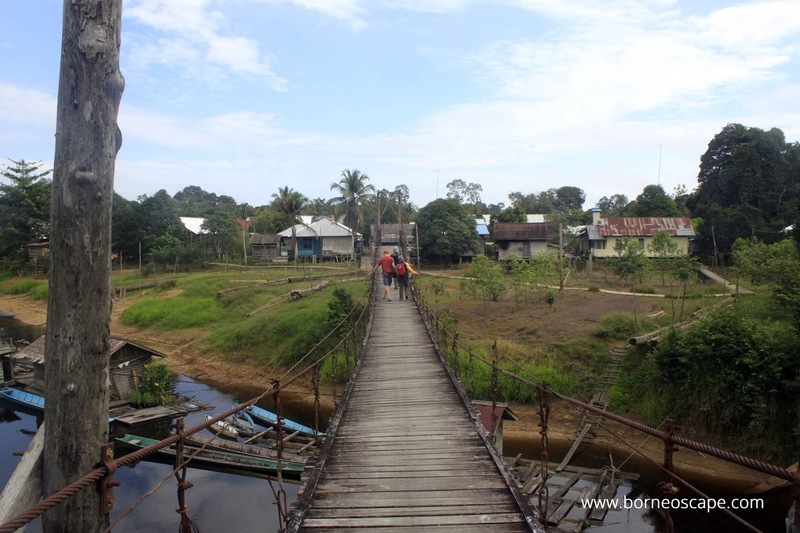 From the suspension bridge, we walked up a wooden bridge connecting the single houses that surrounded the betang house. The houses in the village of Nanga Nyabau have been built high since the past due to security reaseon, especially from floods and wild animals. From the suspension bridge, the betang house is only about 50 meters away. On the left before climb up to the betang, a signage appears written Dipanimpan Bolong. 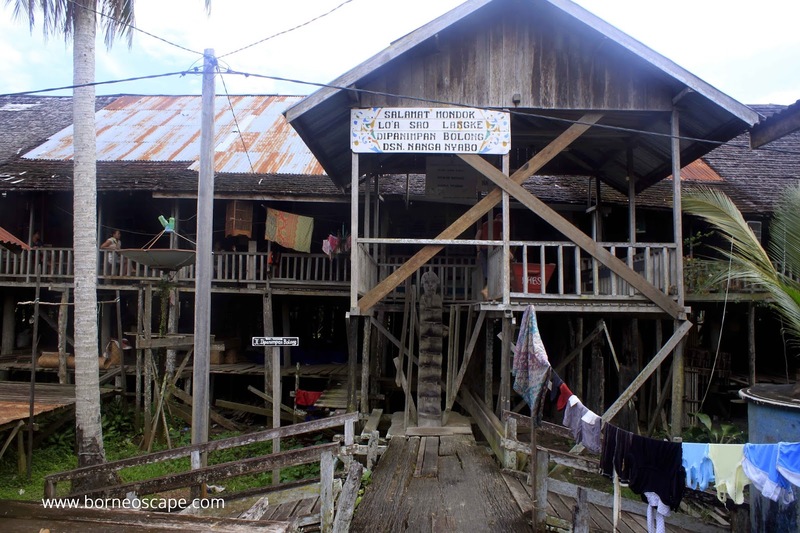 Like most other betang houses, the Nanga Nyabau village betang house is built relatively high, the floor of this longhouse is about 4 or 5 meters from the ground. Because of the height, we have to use the stairs. The stairs up to the betang house is an interesting part of the betang home. These stairs are usually made from Borneo Ironwood (Eusideroxylon zwageri), the top of the stairs is carved into a sculpture shape. A similar form I have seen in Ensaid Panjang Long House in Sintang Regency. Going up to the Long house, we met some women who were chatting on the porch. After a short introduction with them, we spread and cool with their respective activities. Nick and Elin walked to the end of the hulu betang (upstream of the long house), while Aloy headed to hilir betang (downstream of the long house). 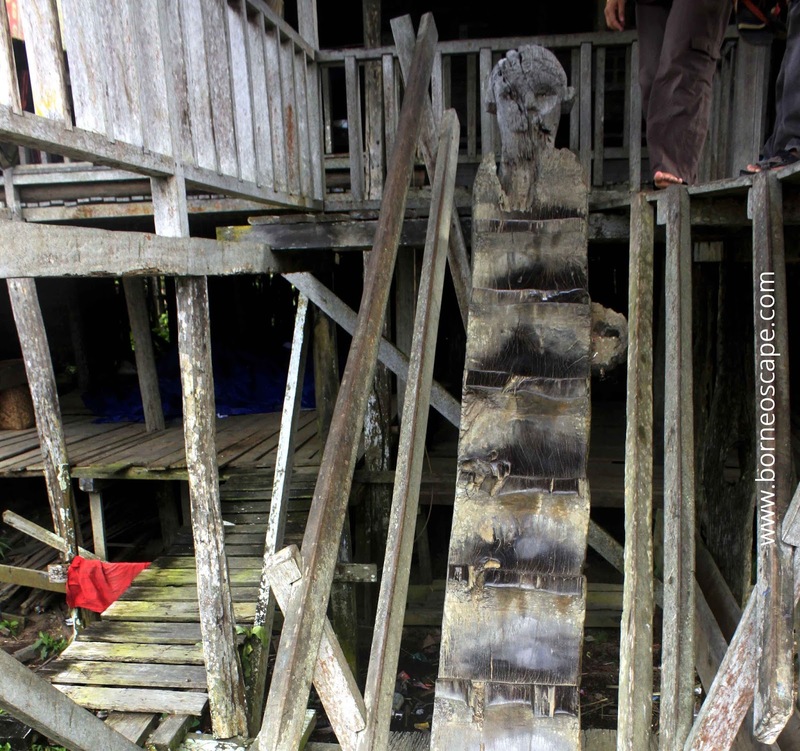 The term upstream and downstream for the longhouse is commonly used because the betang houses are built parallel to the river. Upstream means upstream of the river, downstream means downstream of the river. I remained near the middle rising ladder, looking at and picking up some picture of the posters which explaining the history of the long house we were visiting. Dipanimpan Bolong, that’s how this long house is named. Nanga Nyabau Long House first built approximately in 1896 by Baki 'Jantari and Baki' Jantulak, Baki 'Landung (community leader in Nanga Nyabau). At that time number of doors are 23, corresponding to the number of family head. The founders invited the community to slash or clean the location of the new betang house, and make a ceremony to call the ancestors spirit, who in the language tamambaloh called PAMINDARA. The PAMINDARA was held in 7 days, once it finished, all the community work together move the mast that landslide to a new location and revoke A pole that still stands for use in the betang home to be re-established. 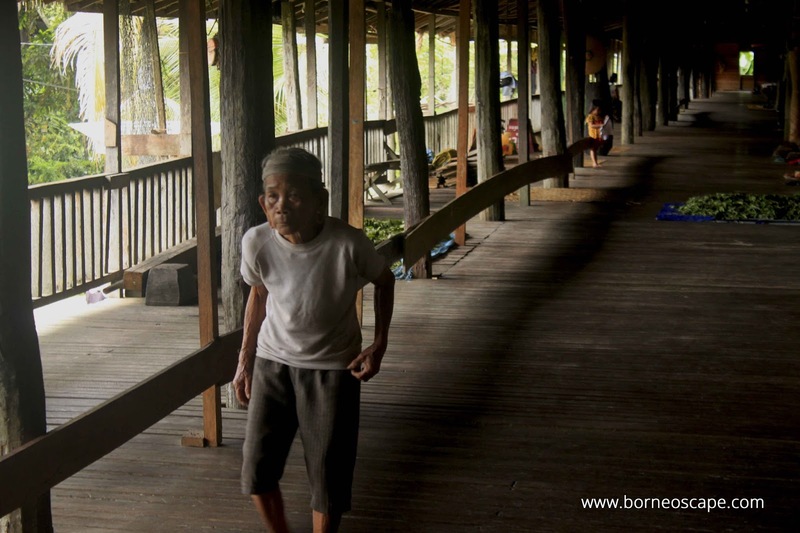 Day to day, the society work together to establish the pondation of the longhouse. The community continues to carry out the development every day. 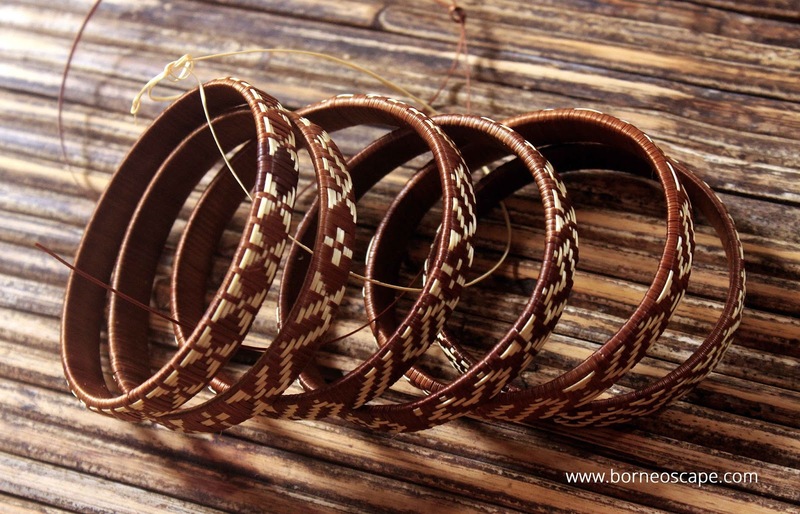 The material used is a pole of Borneo Ironwood, galang and pole mast was made from tekam wood that is cut and split in four square, the walls was made from bark of bedang wood. This long house is called as DIPANIMPAN BOLONG because it is established between two canals of river into 1 (one) of the river APALIN with the river Nyabau. Saved Bolong comes from the language of Timang (Korong Nangis) which in the language of the Dayak tribe Tamambaloh means Pedestal of the 2 (two) rivers that are inundated. After reading the history of the establishment of the long house, I walked around while taking some pictures of the conditions on the betang terrace. Some piles of kratom leaves spread over pandan mats, kratom is one of income source for villagers in Nanga Nyabau. I can see this plant in the garden near to the area were we parked the car. In addition to the pile of dried kratom leaves, the interesting thing I see on this betang terrace is the singer bird which are in the cage. According to the owner, the bird was obtained since about two years ago. Interesting to me because to my knowledge, keeping the bird in a cage is not the custom of the Dayak community. Leaving the bird in the cage, I followed Aloy who just got an information that one of the residents of the long house still has a familial relationship with him, its his aunt. The four of us were then invited to the Aloy family's room for a snack and a drink. Aloy who had come in first seemed to be putting a bracelet of rattan and a resam made by his aunt. His aunt show us how she made the bracelet. Me, Elin and Nick bought some of the bracelet. After chatting for a few minutes, Rio came to tell us that the boat from Nanga Lauk had come. We immediately say goodbye to the owner of the house. Aloy and his friends then left for Nanga Lauk and I went back to Putussibau. Putussibau is the regency capital of Kapuas Hulu. There are 3 types of public transportation that can take you to Putussibau from Pontianak (Province Capital of West Kalimantan); taxi, bus, and airplane. By bus or taxi, it takes 14 hour. If you have limited time or the road make you tired, airplane can take you to Putussibau in just one hour. Sometimes you can get a cheap flight for this rute, just watch the airways website and plan your trip. From Putussibau, the best transport is to rent a car if you come in a group. Because there is no public transportation that can take you to Nanga Nyabau.